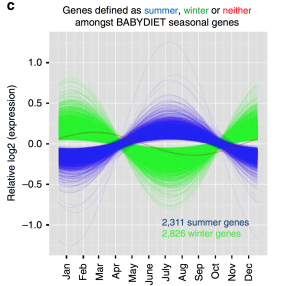 Scientist at Cambridge University recently discovered that our gene expression changes following seasonal pattern. Such discovery may surprise many people since the public generally assumes their genes are deterministic. Yet in reality, most of our genes are not expressed. At any given time, only around 10% of our gene are expressed. Most people imagine their genes working like an architect’s blueprint, everything follows a detailed specification. In reality, our genes are like a giant library, only a portion of the collection is currently checked-out and in used. The fact that our body changes according to the seasons is not a new idea. In Traditional Chinese Medicine, it is part of the fundamental teachings. In the founding text of Traditional Chinese Medicine, Yellow Emperor’s Internal Classics, several chapters are named after the four seasons. These classic texts taught that the standards for a healthy person changes depending on the season. Wellness-promoting regiments should also change with the season. A healthy habit in one season may be a harmful behavior in another season. Why did the ancient Chinese physicians put so much emphasis on the seasons? Because the fundamental insight of ancient Chinese is that change is the only constant. Flow and dynamic equilibrium are the norm. Hence even harmony and wellness are not a static condition. Although change comes in multitude of permutations, ancient Chinese believes that change follows a generalized pattern of yin and yang, very much like modern statistics. Seasonality is the most evident example of patterns in our natural world. Therefore in Traditional Chinese Medicine, seasons become the symbols of cycle of yin and yang.